1. Preheat the oven to 180C/375F. 2. Cut the bread sticks into slices about 3/4 inch thick. Cut them at a slight angle. 3. Brush the bread sticks on both sides with a little olive oil. Bake until light golden, about 10 minutes. Turn halfway through baking. 4. Allow to cool for a couple of minutes and then spread with vegan cream cheese. Sprinkle some spring onions over the top and finish off with slices of asparagus. 5. Serve within a couple of hours. 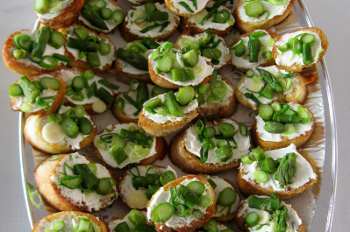 If you want to serve the crostini warm, steam the asparagus while the bread is browning in the oven. They are also nice served cold and if served cold, can be made in advance. The whole Bute Island range of creamy sheese is palm oil free as well as vegan, and is the brand we always use. If you don’t want to make your own bread, the partially baked bread sticks available in most supermarkets work well in this recipe. Most are vegan, but check first. Sainsbury’s and the Co-op label their vegan bread. Thanks – if you try them let us know how you get on.